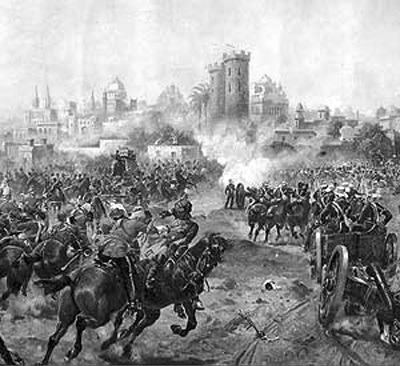 Continued from "The Red Fort is Ravaged Further"
On May 11, 1857 the Indian soldiers serving in the East India Company's regiments in Meerut rose in rebellion against their British rulers. They crossed the river Yamuna and marched into the Red Fort. Then they called upon the Emperor to take command, as was his right. The courtyard and the corridors of the palace were full of rebels. The eighty-two-year-old Emperor's first reaction on seeing them was one of "bewilderment and terror". But the pressure of circumstances combined with the persuasion of his own sons eventually made him listen to their demand. He agreed to throw in his lot with the rebels. The mutiny spread across the land like wild fire. Brave young men and women from every province rushed in to help in any way they could. Mangal Pandey in Bengal, Malika Hazrat Mahal in Oudh (now Awadh), Kunwar Singh and Amar Singh in Bihar, Nana Saheb Peshwa, Tantia Tope and Azimullah in Kanpur, Rani Laxmibai in Jhansi and many others sacrificed everything for their motherland. Fierce battles between the Indian and the English troops raged all over the country and continued for many months. Delhi was plunged into utter chaos. Soldiers, young and old, trained and untrained, poured in to take part in the great Revolt. But there was neither any ration nor ammunition for them. The treasury was totally empty. The soldiers who had nothing to eat for days on end, were driven to loot and plunder. The Emperor tried his best to restore order but no one paid any attention to his words. But there was one significant feature of the rebellion at Delhi that deserves special mention. Bahadur Shah Zafar had succeeded once again in doing something remarkable. He was totally successful in maintaining communal harmony as he had done within the Red Fort. He stated emphatically that there should be no quarrel between the Hindus and the Muslims. Fearing that there might be some trouble during the coming Id festival, he went to the extent of proclaiming (on July 9, 1857) that anyone killing a cow “would be blown to bits from the mouth of a cannon”! The Hindus and the Muslims joined hands and attacked the British vigorously. But the Indians lacked provision and ammunition. They also lacked the right kind of organization. Moreover, the British were prepared to stake anything and sacrifice everything in order to recover Delhi. Eventually, it resulted in victory for the British on September 20, 1857. 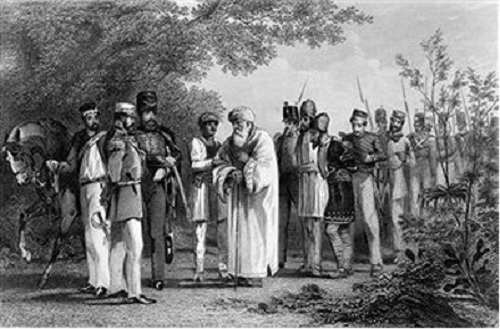 Bahadur Shah Zafar was compelled to flee with his family and seek refuge in Humayun's tomb while the British regiment marched into the Red Fort. Bahadur Shah Zafar and his wife Zeenat Mahal surrendered to Hodson on September 21, 1857. The next day Hodson, arrested the princes (two sons and a grandson of the Emperor) and sent them to Shahjahanabad. Hodson followed and overtook them near the Khuni Darwaza, (which then was known by another name) and ordered the princes to take off their upper garments. Then he shot them one by one. The Khooni Darwaza, (Bloody gate) where the sons of Abdul Rahim Khan-i-Khanan had been beheaded during Humayun's reign, and where the head of Dara Shikoh had been displayed, lived up to its gory name once again. Hodson's own excuse for the inhuman act was that if he did not kill the princes on the spot, the crowd might have saved them. “No reasonable man,” writes historian R.C. Majumdar, “has ever attached the least value to the excuse offered by Hodson for this brutal conduct, ...which even the English historians have described as an 'outrage against humanity"'. The three bodies were taken to the Kotwali and stripped of all clothes except a loincloth and laid on the stone slabs outside the building before they were buried. Soon afterwards the British hanged 21 other princes of the royal family. And Bahadur Shah Zafar was tried for rebellion. On January 27, 1858, the last Emperor of the Mughal dynasty was brought to the Diwan-e-Khas as a captive, the same hall where his forefathers had sat on the magnificent Peacock Throne and meted out justice to others! After being kept waiting for an hour and a half, he was produced before the Military Tribunal. His sentence was pronounced on March 9, 1858. It was an order of exile and life- imprisonment. He was exiled to Rangoon with his Queen Zeenat Mahal where he breathed his last on November 1862. People who heard the news. said - 'Khuda bakshe bahut si khubian theen marnewale mein' (God forgive the departed : he had many talents) “Bujha hai Chirag-i-Delhi” cried the people, “The light of Delhi has gone out”. And so the great Mughal dynasty came to an end. And there was no one left to carry on the name. All houses and buildings around the Fort where the British forces were to be stationed were pulled down and the lofty walls around the city were lowered. Famous bazaars, such as Khas Bazaar, Urdu Bazaar, Khanam Ka Bazaar and many others were destroyed beyond recognition. The area between Rajghat and the Jama Masjid was levelled and the main gate of the Dariba was pulled down. 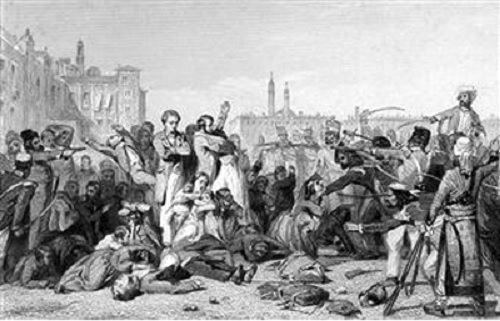 The events of 1857 brought the East India Company's rule to an end. India was now to be governed by and in the name of Her Majesty, the Queen Victoria. Lord Lytton held a magnificent Durbar on January 1, 1877, at Delhi to celebrate the Queen's taking over as Kaiser-e-Hind, the Empress of India. The venue of the Durbar was along the historic ridge, where for three months the fierce mutiny had raged. 79 ruling princes, 1,200 civil servants, 14,000 British and Indian troops took part in the celebrations, that were attended by nearly 68,000 people. 26 years later, on January 1, 1903, the Viceroy Lord Curzon arranged the second Durbar at Delhi to proclaim Edward VII as the Emperor. This ceremony took place within the Red Fort, at the Diwan-i-Am. The Diwan-i-Khas was converted into a banquet hall. On December 12, 1911, there was a third Delhi Durbar in the presence of George V and Queen Mary, where the historical announcement about the transfer of India's Capital from Calcutta to Delhi was made. First image from the cover of "Essential Histories".